Cindy Doan is only 17, but the North Thurston High School junior is already proficient in three languages, including English, Spanish and her native Vietnamese. Doan is one of a growing number of high school students who are using their world language skills to earn high school credit and the Washington State Seal of Biliteracy, which provides students high school credits and a notation on their diploma and transcript if they pass one of several comprehensive exam options. It was established to recognize public high school students who have attained a high level of proficiency in speaking, reading, and writing in one or more world languages in addition to English, and can be attractive to future employers and college admissions officers. The students must also be on track to meet their English Language Arts (ELA) graduation requirements and pass ELA state assessments. The Seal is awarded at the end of the senior year. Doan’s family signed her up for a Vietnamese school where she would practice and continue learning the language. “I wanted to learn more Vietnamese to be able to communicate better with my family and because it was a skill I wanted to have.,” said Doan. “After I started to go to school where I would speak only in English for hours on hours, my parents started to notice that I was stuttering with my Vietnamese which was why they signed me up for Vietnamese school.” As far as Spanish, Doan wished to understand the language due to it being the second most spoken language in the United States, she also believed it would be beneficial to her future career as a nurse practitioner. North Thurston Public Schools recognizes the value of preparing students to be global citizens with the skills to communicate in English and other world languages, and therefore offers an opportunity that allows students to be nationally recognized as bilingual. 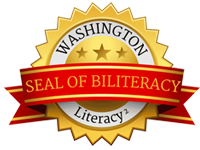 The World Language Proficiency Credit Program and the Washington State Seal of Biliteracy are both ways that students can earn high school credit for a language they may already know. Learning another language increases the number of people you are able to communicate with throughout the world. If English is your only language you can only communicate with 20% of the earth’s population, by learning another language you increase that percentage. It opens up various doors to new opportunities; especially in career fields. It makes you stand out when getting into college programs, jobs, and internships. La Frenier began learning French in eighth grade and has been studying the language for seven years, and is now pursuing a French major at Central Washington University. “I started learning French originally to fulfill my two year foreign language requirements, however I began to love the language and its culture so I chose to continue my studies,” said La Frenier. For families and students who want to know more, there will be a district-wide Language and Culture Family Night at Chinook Middle School on April 11th from 6:00-7:30 pm. NTPS is offering the STAMP test on March 16th. Please contact our office or your high school for more information.